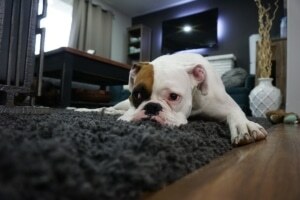 The Carpet Chemist Allergy Friendly Carpet Cleaning has the exact same powerful effectiveness as our Lime scented cleaning products, but doesn’t have the great smelling fragrance our customers rave about. We know all about the nesting stage during pregnancy, and the cleaning concerns that go right along with them. You want everything to be as pure and clean as water, for your newborn baby. That’s why we developed a line of Carpet Chemist Allergy Friendly Carpet Cleaning ‘Pure and Clear’ carpet cleaning solutions that are just as effective at removing spills and soil as our lime-scented cleaning formulas. Pets are no exception when it comes to smell sensitivities or allergies. Our carpet cleaning solutions are soap free and hypo-allergenic and will never ever leave any residues in your carpet. All you’ll be left with is pure and clean, soft toe-squishy carpet that’s safe enough to lay your newborn baby down on. Pet Urine Enzyme Treatment. Our Fresh Lime-scented Carpet Chemist Pet Urine Enzyme Treatment is scientifically formulated to eat and digest odor causing bacteria, which eliminates smells forever. If anyone in your home has smell sensitivities, allergies, or other medical issues that could be affected by scented cleaning products, ask for our Pure and Clean Allergy Friendly Carpet Cleaning when you schedule your appointment. Have Smell Sensetivity. All of our products that The Carpet Chemist use are extremely safe for pets and kids, but some do contain our famous lime-clean scent. Don’t worry. We formulated the same powerful cleaning agent without the lime-clean scent. Have Allergies. If you’re like a lot of people in the Ohio Valley, you might suffer from allergies. Sometimes scented cleaning products can stir up those allergies, so we recommend the Carpet Chemist Pure and Clean Allergy Friendly Carpet Cleaning method for you. Are Pregnant or Expecting. Pregnant women may be more sensitive to smells than anyone. Once the nesting phase kicks in, you’ll want to scrub every inch of your home, in preparation of the new baby. Be sure to ask the Carpet Chemist for the Pure and Clean scent-free carpet cleaning when you schedule your Allergy Friendly Carpet Cleaning appointment. Our family is just like yours. Trust Louisville‘s most allergy friendly carpet cleaning company to take care of all your carpet needs for you. We’re MAD about carpets! Call (800) 515-1342 to schedule carpet cleaning, carpet dyeing, carpet repair and specialty stain removal. For your convenience, you can also upload an image of your carpet stains and your friendly neighborhood Carpet Chemist will respond with a free phone estimate. Your email is safe with us. We respect your privacy and will never sell or share your information with third parties!